Even your biggest smokes are no match for the Vertigo Big Daddy cigar cutter. Equipped with two stainless steel guillotine blades, this ergonomically-designed cigar cutter provides a clean cut on any cigar, up to a massive 80 ring gauge! A must-have accessory for any big-ring enthusiast. Big or small, it chops em' all! Picked up a batch of these for my shop after we got in the 70 and 80 ring cigars. Solid and dependable cutter for the big stogies. The best cutter I have. I got one of the Vertigo big daddy 80 ring cutter as a gift and it's the best cutter I have it beats my Xikar and Colibri cutters by a mile it's razor sharp no cracked and unraveled cigars with this cutter and the blades move so close together it's like watching scissor blade move together. If you are looking to cut bigger ring gauge sticks, this little thing works well! The looks are nothing special - It looks and operates just like your standard cheap-o cutter, with the opening being larger than any 80rg cigar I've used it on. Nice and sharp, feels solid, and makes a great, clean cut! Great for the big gauge smokes, particularly if you tired of doing multiple punches or other means to get that cap cut! Strong Sharp easy to hold ,Perfect. The reason I buy from Best Cigar is because Ramrod cigars can become dried out if they sit in a warehouse as they do with other vendors. While not perfect, Best Cigar does the best job of keeping my preferred cigar moist and fresh. It has happened, but rarely do I purchase a box of Ramrods that are not in good, or very good, shape. With the ability to handle a large ring gauge and being light yet strong it is the perfect fit for my golf bag. Good cutter for the price. I don't have an opinion. I lost it before I got to use it. Surprising good experience with this cutter. Very capable of large gauge cigars and small. Cuts surprisingly well for this style in my limited experience. Minimal crushing. Quite pleased with it. 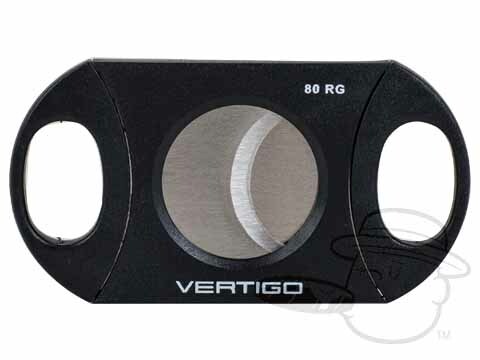 Vertigo Big Daddy 80-Ring Cigar Cutter is rated 4.3 out of 5 based on 24 customer ratings.